On April 13, 2018 business, industry, and academic partners from throughout Delaware and the Mid-Atlantic region gathered Wednesday to honor SkillsUSA members at the Modern Maturity Center in Dover. More than 300 students were recognized for their outstanding performance in 63 individual, team, technical, and leadership contests with nearly $875,000 in student scholarships and prizes awarded. 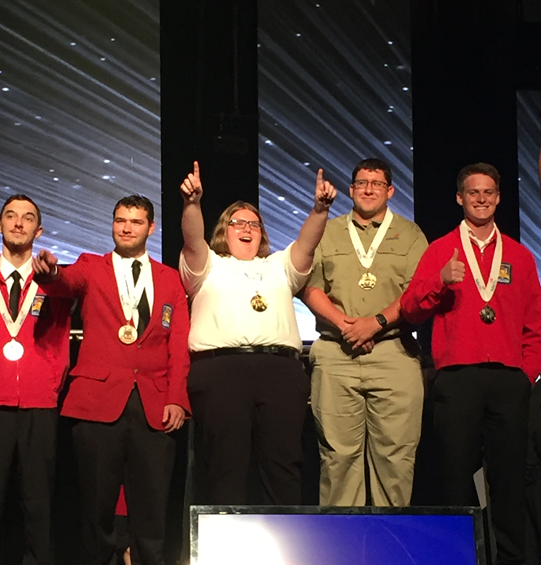 The top medalist in each contest will further advance his or her outstanding achievement at the National SkillsUSA conference in Louisville, Kentucky. Click here for the list of results. Click here for the awards PowerPoint presentation. The State Officers from Delaware SkillsUSA in collaboration with officers from Delaware Technology Student Association, Business Professionals of America, DECA, Educator’s Rising, Family Career and Community Leaders of America, and HOSA hosted the annual Fall Leadership Conference (FLC) at Delaware State University on October 25th, 2017. The FLC was sponsored by the Delaware Department of Education, Delaware Advisory Council on Career and Technical Education, and Delaware State University with 831 participants representing 115 chapters who participated in a series of workshops that emphasized the importance of leadership and service through Career and Technical Education. The conference featured guest speaker House Minority Leader Daniel Short, Representative of the 39th District. 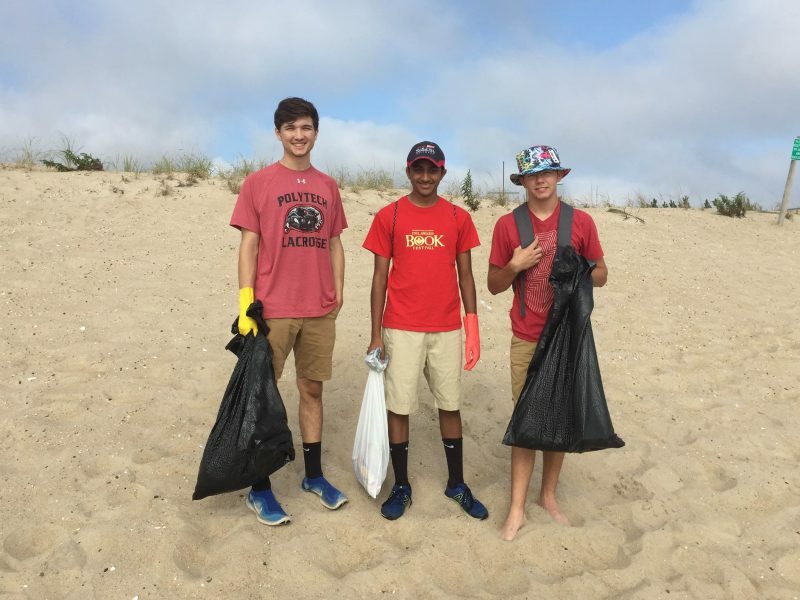 Delaware SkillsUSA State Officers participated in International Coastal Cleanup Day on Saturday, September 16th. Coastal Cleanup was sponsored by the Delaware Department of Natural Resources and Environmental Control (DNREC). SkillsUSA State Officers cleaned the shore line at Bethany Beach. Delaware’s Cleanup is also part of the Ocean Conservancy’s International Coastal Cleanup, the world’s largest annual clearing of trash from coastlines and lakes by volunteers. Students and advisors from across Delaware attended the 53rd annual National SkillsUSA Leadership Conference from June 19-23, 2017 in Louisville, Kentucky. Delaware students represented our state in competitive events that included: Architectural Drafting, Automotive Service Technology, Aviation Maintenance Technology, Carpentry, Computer Programming, Cosmetology, Criminal Justice, Diesel Equipment Technology, Electronics Technology, Extemporaneous Speaking, Heating, Ventilation, Air Conditioning & Refrigeration, Industrial Motor Controls, Information Technology, Masonry, Plumbing, Prepared Speech, Technical Math, Welding, and more. A delegation of 119 students and advisors from 6 schools represented Delaware. Kimani Jackson of Howard High School of Technology was selected to sing the National Anthem at the Opening Ceremony of the SkillsUSA National Leadership and Skills Conference. Delaware SkillsUSA is a Career and Technical Student Organization (CTSO) dedicated to students who are interested in pursuing their future in technical careers. Through SkillsUSA, members have the opportunity to participate in career focused competitive events, take part in community service work, and become leaders for the organization in their school, state, and at the national level. SkillsUSA incorporates curricular and co-curricular experiences to emphasize the importance of knowledge, leadership, skill development, and teamwork. 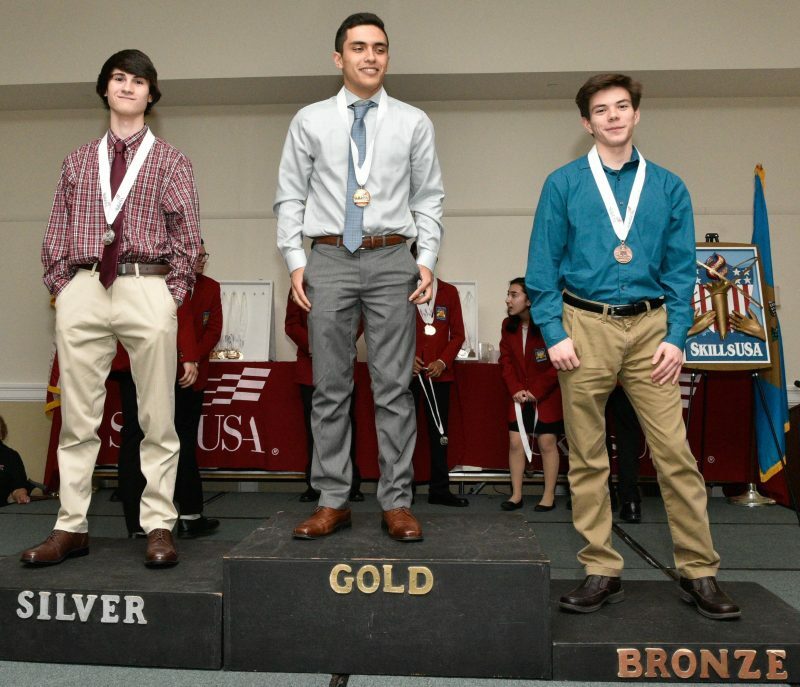 A list of all national finalists can be obtained online from: http://skillsusa.org. To learn more about Delaware SkillsUSA, please visit: http://delawareskillsusa.org/ or contact Mike Fitzgerald by phone at: 302.735.4015 or by email at: Mike.Fitzgerald@doe.k12.de.us. The state officer team met together for the first time to meet with the representatives and senators in the state house at the annual CTSO legislative day. 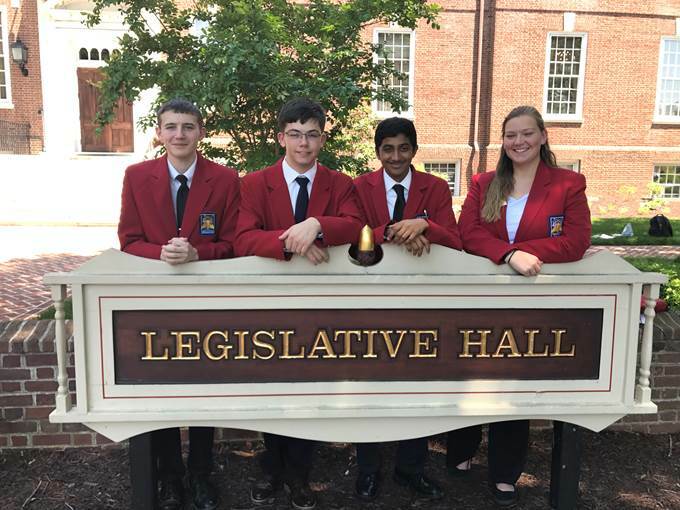 SkillsUSA President, Ashish D’Souza led the officer team throughout the day while also speaking in both the house of representatives and the senate with his prepared speech that focused on the need for students to practice both leadership and technical skills as advanced by student participation in the Delaware SkillsUSA. ©2019 Delaware SkillsUSA, All rights reserved.